OSM Maritime Group, a leading shipping company, has announced it will introduce Cloud Fleet Manager (CFM) from Hamburg-based software provider Hanseaticsoft as part of its business digitisation strategy. OSM Maritime will use the CFM portal as a central data and information platform – the system will replace other technology including its existing decentralised data storage system. 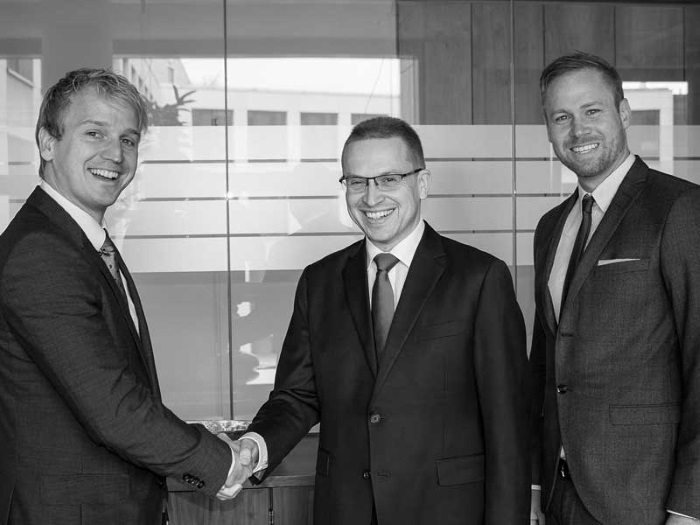 From left to right: Alexander Buchmann, CEO, Hanseaticsoft. Bjoern Sprotte, Managing Director – Technical Management & Services, OSM Maritime Group. Nils Andersen, Chief Commercial Officer, Hanseaticsoft. In accordance with the company’s “always-on” mentality, customers can access up-to-date information 24 hours a day. With this decision, the company remains faithful to its principle of offering high-quality and reliable services to its customers and enabling them to concentrate on their core business. In this context, the modernisation of processes should, in addition to a reduction of the communication effort, lead to increased transparency. “The reliable exchange of information and the rapid provision of all relevant data for the responsible persons enables processes to be accelerated rapidly and reduces additional work and expenses. This is particularly important to meet the growing requirements of digitisation and the need to optimise business processes.” said Steffen Tunge, Managing Director of OSM Ship Management Singapore. With this decision, OSM Maritime Group sets an example of the company’s future-oriented, modern and innovative approach. Previous: GMS Week 38 – SALES & SPECULATION!